Tom Yum Thai soup is the most popular recipe of all the Thai soups. It usually includes shrimp, but a vegetarian version is just as satisfying. Tom Yum soup is famous worldwide, and could possibly boost the immune system and help fight off cold and flu viruses. The authentic Tom Yum recipe does not include coconut milk. However, some people prefer it with this ingredient (which makes it Tom Kha), resulting in a thicker, richer tasting soup. Coconut milk is listed as optional here--if you decide to omit it, be sure to add a little more stock. In Thailand, they often use Carnation evaporated milk, which is a good option for vegetarians, while vegans will prefer to use coconut milk. This vegetarian/vegan version is easy to make, and just as healthy (if not more so) than the traditional recipe. Make this easy soup today as an appetizer, for lunch or as a nutritionally complete dinner. You'll love how it warms and energizes! Pour stock into a soup pot. Add the prepared lemongrass, plus the lime leaves, chili, garlic, and galangal or ginger. Bring to a boil and continue boiling for 5 minutes, or until broth is very fragrant. Add the mushrooms. Reduce heat to medium and simmer for 5 to 8 minutes, or until mushrooms are soft. Add the bok choy and cherry tomatoes. Gently simmer 1 to 2 more minutes (bok choy should remain on the crisp side). Reduce heat to low and add the coconut milk if using, sugar, soy sauce, and lime juice. Add the soft tofu and gently stir. Taste-test and adjust as needed. 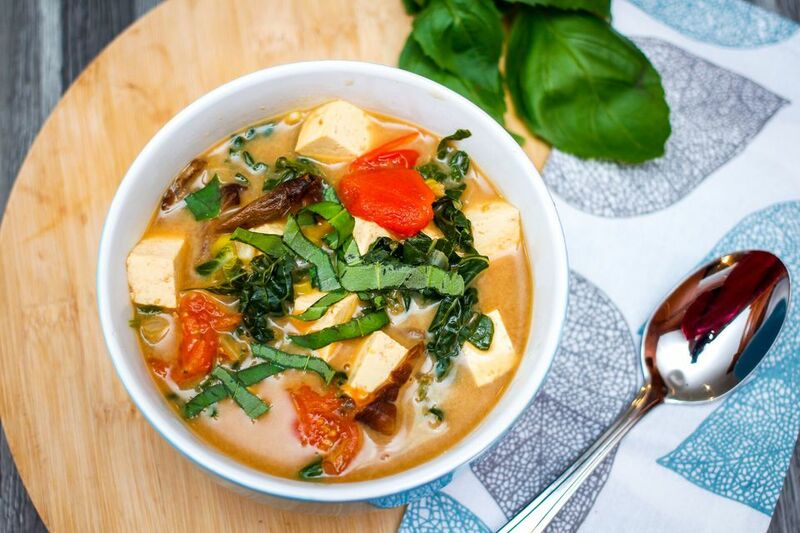 To serve, ladle soup into bowls with fresh basil and coriander sprinkled over. If making the stock from cubes or powder, but sure to make it strong (if it tastes good on its own, it will make a better soup). When taste-testing, add more chili or chili sauce if not spicy enough. If not salty enough, add more soy sauce or a little more stock or salt. Add 1 more teaspoon sugar if too sour. If too salty or sweet, add another squeeze of lime juice.